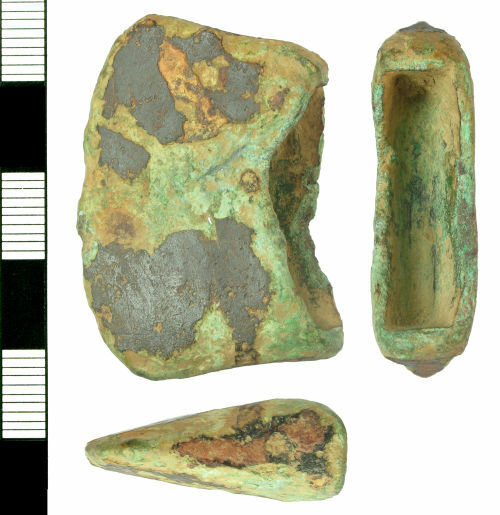 A fragment from a cast copper-alloy axehead of Late Bronze Age date. The fragment consists of the lower blade and includes a slightly, expanded cutting edge. The axehead has been broken in an abraded, irregular curve just above the socket end. Also visible are the sides above the socket end, one of which survives as somewhat thicker than the other. The distance between socket end and cutting edge can be measured at c. 20mm. The object is highly corroded. It is largely a light, dusty green colour, but with some areas of dark-brown patina. The axehead is most likely to date from the Ewart Park phase (1000-800 BC), a period in which scrap metal hoarding was prevalent.